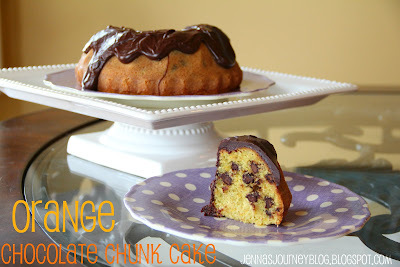 Orange and chocolate are one of those to die for combinations in my book. When I was a kid my mom used to buy me those chocolate oranges that you would slam on a table and they would break into segments. YUM. This is the grown up version of that childhood favorite of mine. Preheat the oven to 350 degrees. Butter and flour a 9” bundt pan (I used my small bundt that isn’t very deep). Cream butter and sugar in a stand mixer with a paddle attachment on medium speed for about 3 minutes. Add the zest and eggs and beat well. Next, whisk together your dry ingredients (flour, baking powder, salt and baking soda). In a liquid measuring cup, combine your wet ingredients (buttermilk, OJ and vanilla). In a small bowl, toss chips or chunks with about 1 tablespoon of flour, making sure to coat them well. This will keep them from sinking into the cake. Add dry and wet mixtures alternately to you batter with your mixer on the lowest speed. Once all of your dry and wet ingredients are incorporated, add your chocolate. Mix until just incorporated. Put batter into your bundt pan evenly. Bake at 350 for about 45 minutes or until a toothpick inserted on both sides comes out clean. Let cool for about 5 minutes and invert onto a plate, then let cool about 25 minutes for starting the ganache. For the ganache, melt the chocolate and cream in a double boiled, stirring, until completely smooth. 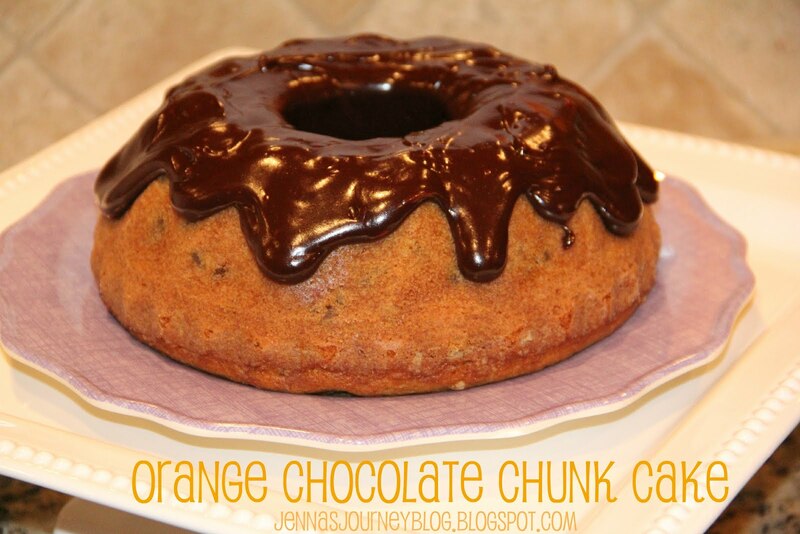 Add more chocolate OR cream as necessary to achieve the right consistency. Pour over the cake.